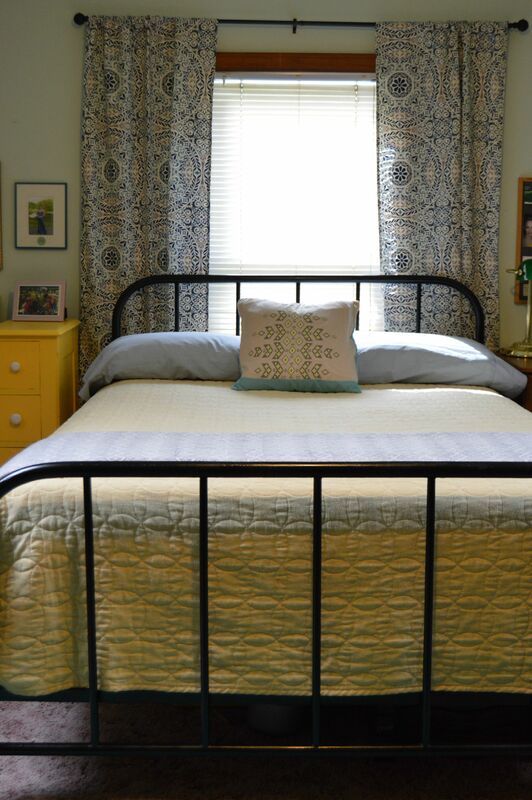 About two years ago, I decided my bedroom was in need of a major overhaul. I painted it, and then it sat, waiting to be finished, until this past week! I am so, so happy with it, even though my original vision is quite different from what I ended up with. After many long months and hard work, I finally took some photos to share. 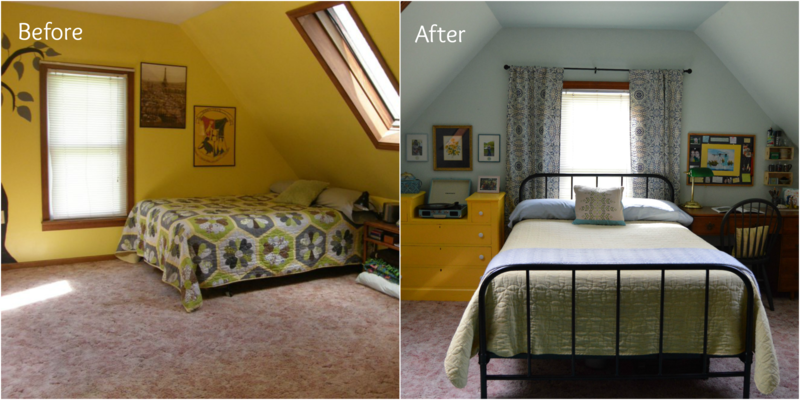 As much as I loved the yellow, it was a bit much, and the arrangement of the furniture made the room feel really big and empty. I painted the walls a light blue (I was really going for more of a mint color, but I ended up with a light blue, which ended up working out just fine). I also painted the ceiling a slightly darker shade of blue than the walls. 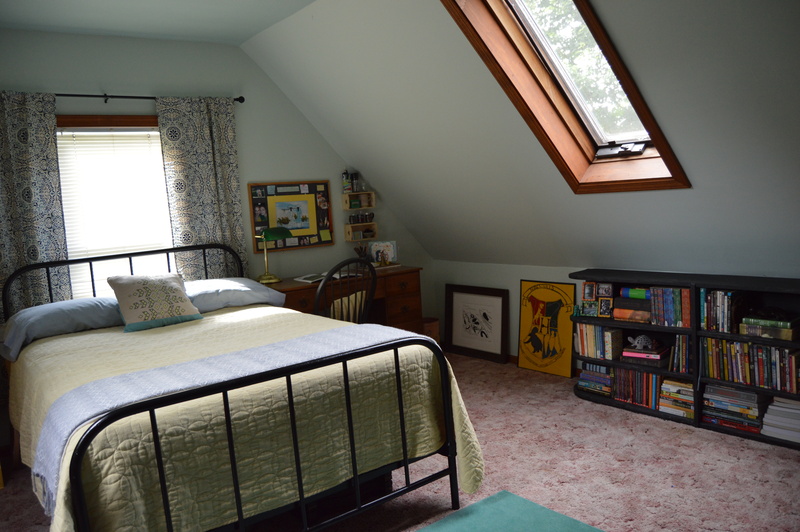 I then rearranged the furniture, eventually settling on putting the bed in front of the window. Because the room has slanted walls, the only place for the bed that really made sense was to center it on this wall, which meant placing it in front of the window. I made some curtains from fabric I got on clearance at JoAnn Fabrics. To make the bed seem less awkward in front of the window, I hung the curtains so that they would be wider than the bed. This is the view of the room as you enter from the hallway. 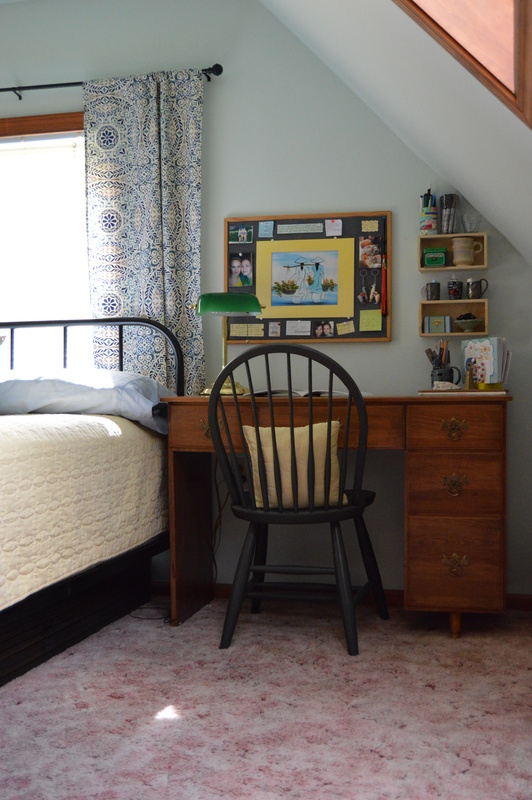 Instead of nightstands on either side, I utilized the flat wall (there are only 2 in the room) by placing a desk on one side and a small dresser on the other. You can also see the ceiling in this photo. Because the ceiling is such a narrow strip, I didn’t want it to stand out. I considered painting it the same color as the walls, but thought that might be a bit much of one color, so I painted the ceiling a shade darker than the walls. I really like how it looks. The desk is rather petite. My dad and grandpa refinished it for me when I was a little girl, so it means a lot to me. The desk top was getting rather crowded, so I mounted a couple of small wooden boxes to the wall to create little shelves that can hold pens, markers, and other odds and ends. The chair is a simple dining room chair that I painted a beautiful dark charcoal color. On the other side of the bed is a small glove-drawer dresser. This was one of the biggest projects I did for the room. I got this dresser for free from a neighbor. Although very solid, it had been stored in a barn for quite some time, so it was grimy and had lost a lot of its luster. 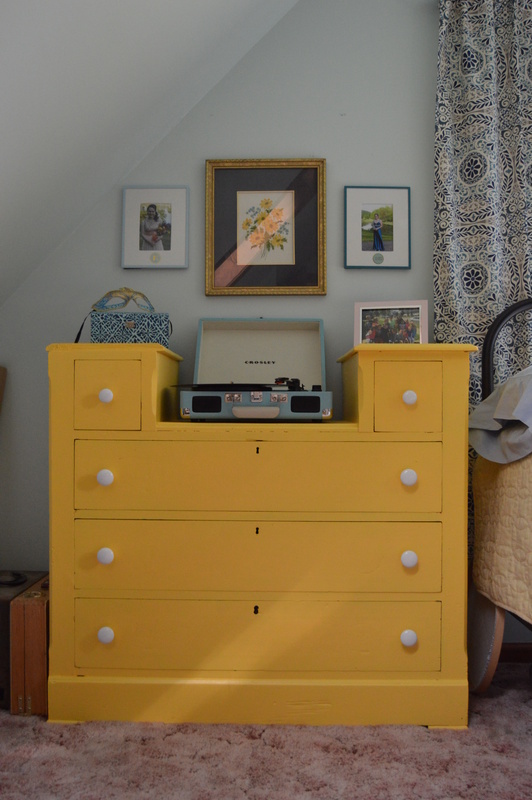 I cleaned it up, painted it a bright yellow (my favorite color) and added ceramic knobs. I am SOO happy with how it turned out. Above, my junior and senior prom pictures flank a flower painting that my great-grandmother painted. This corner is my favorite part of the room. 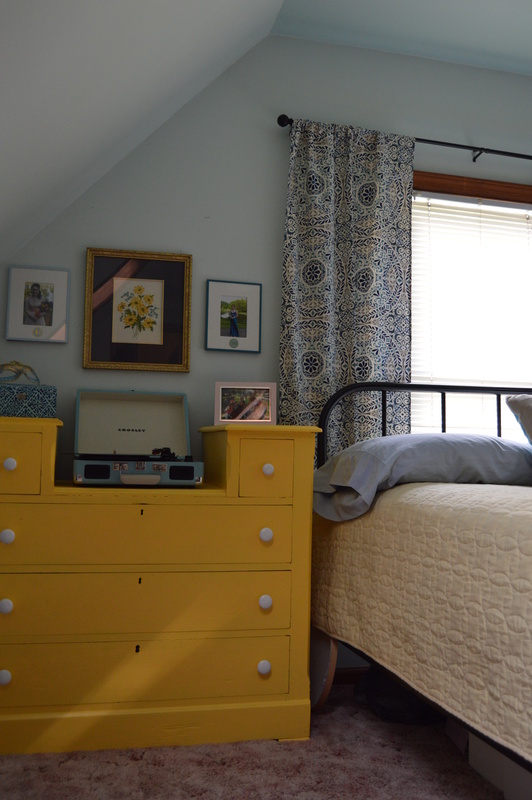 I love the way the bright yellow looks next to the curtains and the black bed. Here you can see how everything works together. 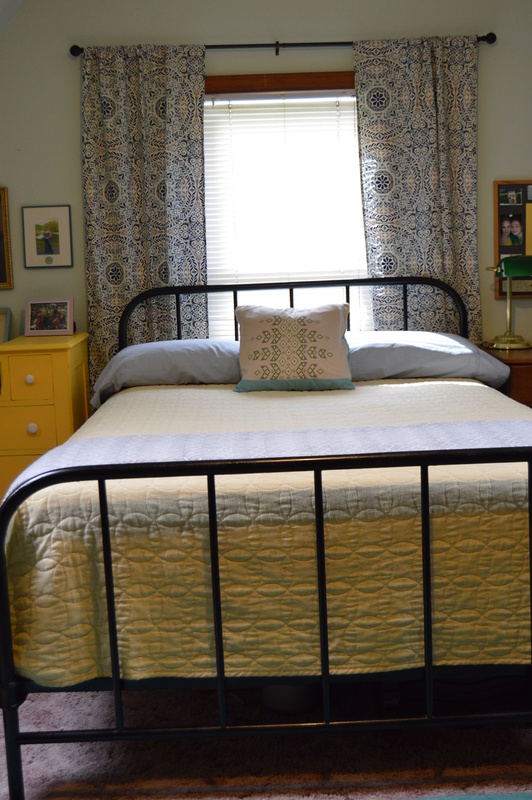 The bed was another big project. I knew I wanted an iron bed in here so that the light from the window wasn’t blocked, but my bed is a full, so I ran into a lot of trouble finding one that would work. My dad was rummaging around in the garage of his office building (he owns a real estate business) and found this frame. We measured it and it was a perfect fit! It needed a lot of scraping and sanding to remove the old, flaking lead paint. Then I spray-painted it a glossy black. I can’t believe how nice it looks now! This shows the wall to the left of the door as you walk in the room. 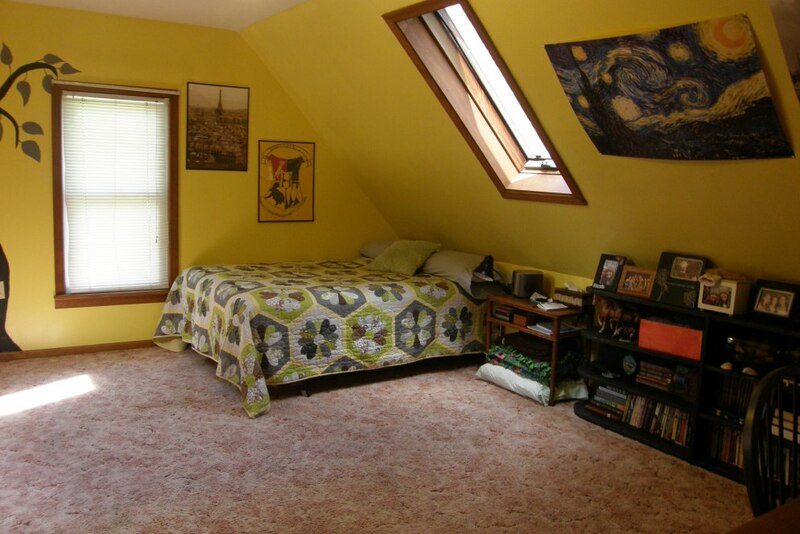 Because of all of the weird angles of the room, the closet was actually built into the room, which creates the bump-out you can see here (it doesn’t look too bad on the outside, but the closet has some super weird angles on the inside from the various roof lines meeting). The small slice of wall to the right of the closet door is the perfect place for an antique mirror. 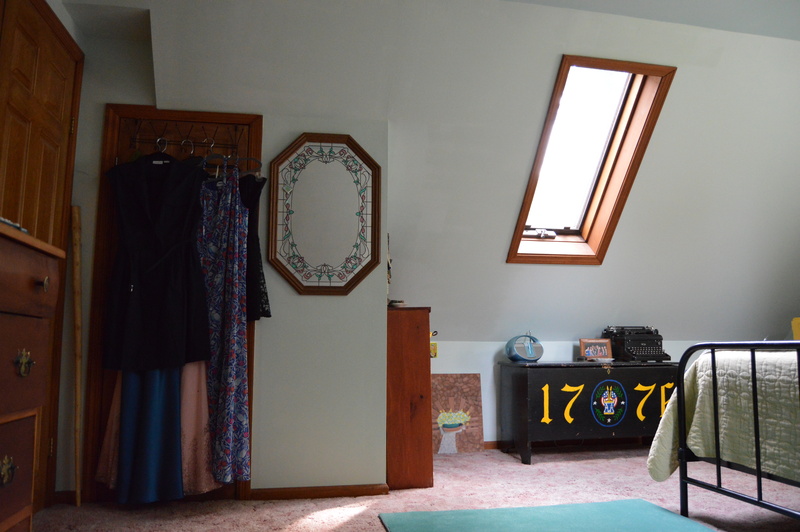 The closet is very small and has very short, slanted ceilings, so it cannot hold longer dresses. I bought an over-the-door hanger several years ago in the hopes that I could hang dresses inside the closet, but the door won’t shut with it there, so the dresses hang outside the door. They actually give the room some nice color, so I really don’t mind it. The chest to the right of the closet is actually my brother’s. It is a family heirloom. Because there are only two walls that artwork can be hung on, I wanted to make sure I took advantage of them. 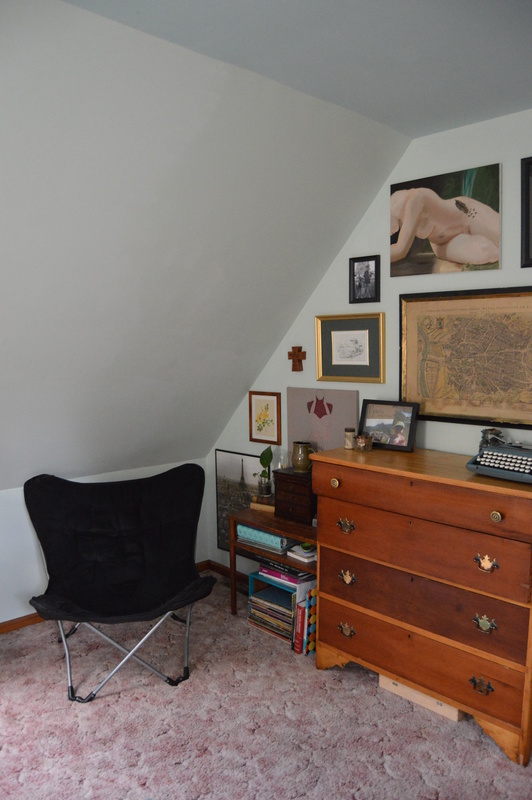 This wall holds my dresser and a gallery wall. I’m really happy with how it turned out. This corner is my reading corner. A simple butterfly chair is a very comfortable spot to read. The closet also creates this little nook. 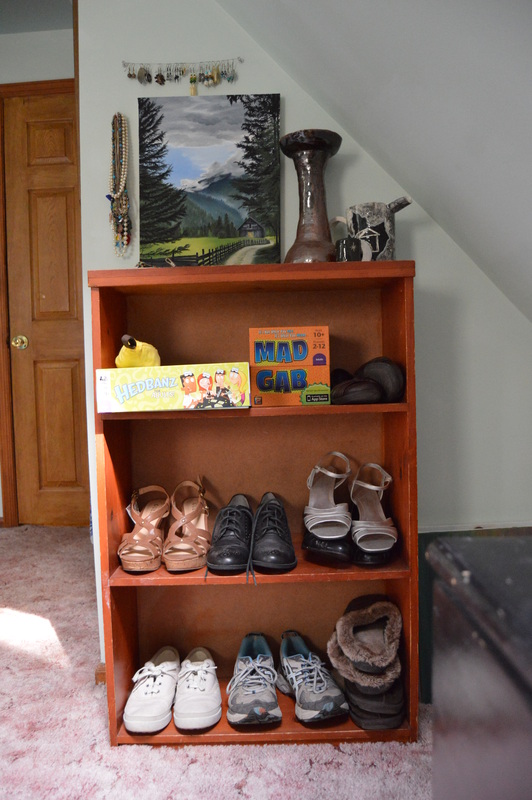 A small bookshelf holds my shoes and some board games and the top functions as my vanity area. A wire hung with thumbtacks is the perfect place to store my earrings, and a hook holds my necklaces. The beautiful painting was done by one of my super-talented college friend, Jess. 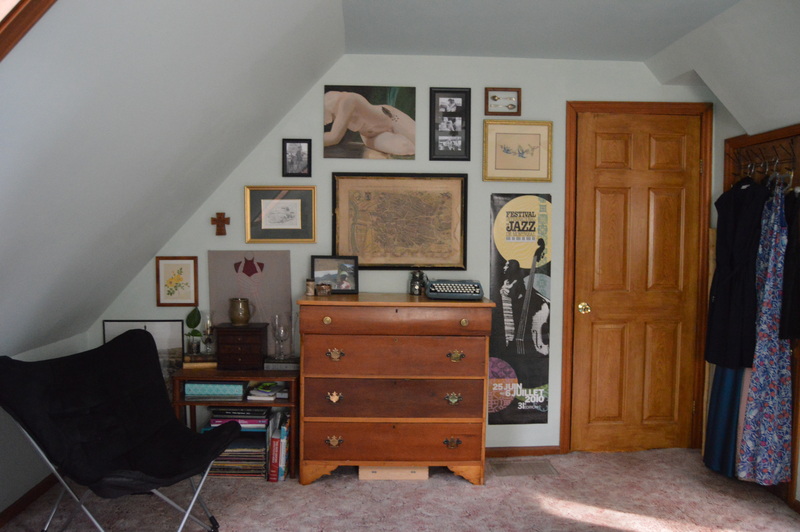 The right side wall holds my large bookshelf and some artwork. The shelf was a perfect find by my parents many years ago. 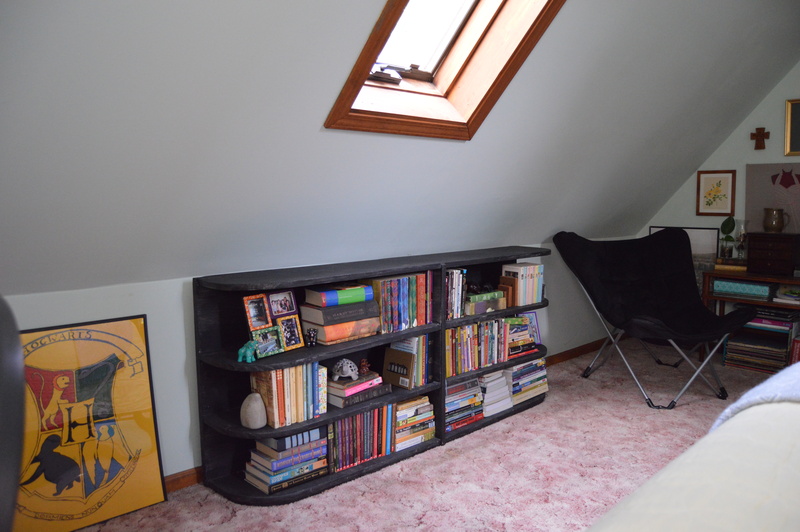 It fits right under the slanted walls and holds a lot of books. I painted it black several years ago. I love the bright pop of color the books on the shelf add. The bookshelf also holds my turtle collection, two of which you can see here. 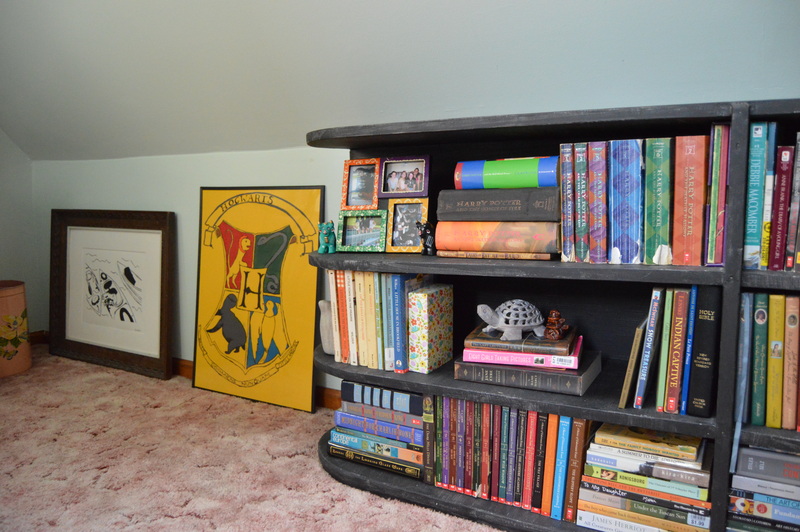 The Hogwarts crest was a painting I did in middle school and it sits next to a print I made in a printmaking class at college. 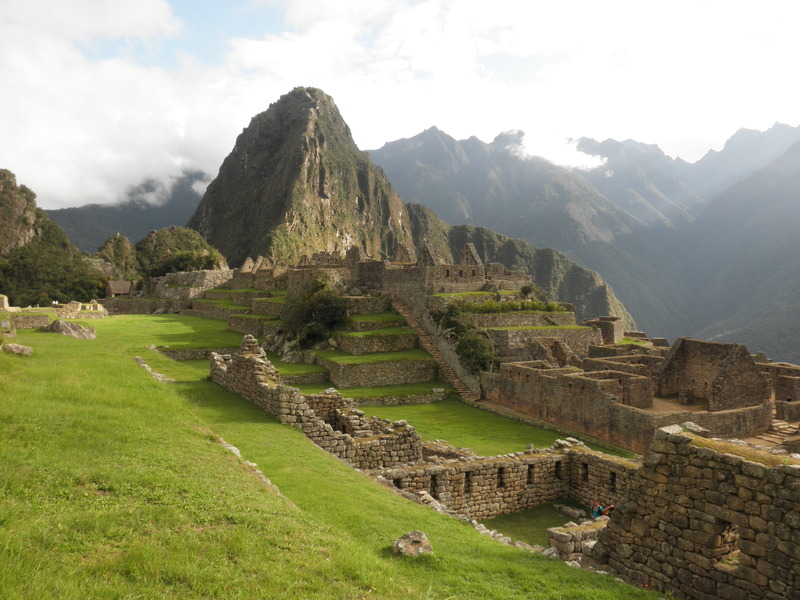 The same wall, looking the other way. 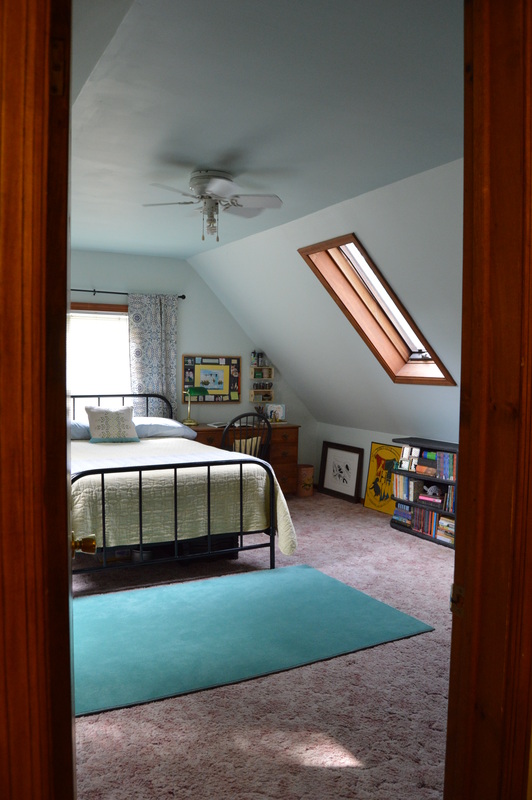 One of the things I love most about the room is the large skylights. 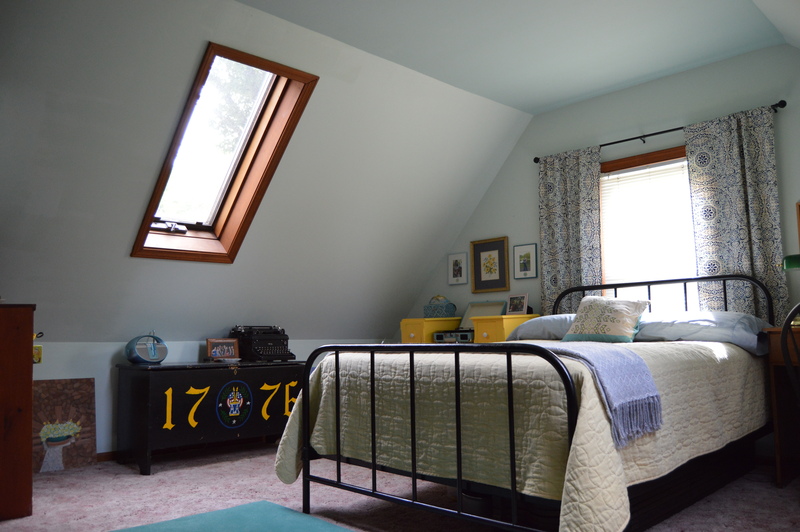 With only one regular window, they make a big difference and flood the room with light, especially in the summer (during the winter, they sometimes get covered with a bunch of snow). 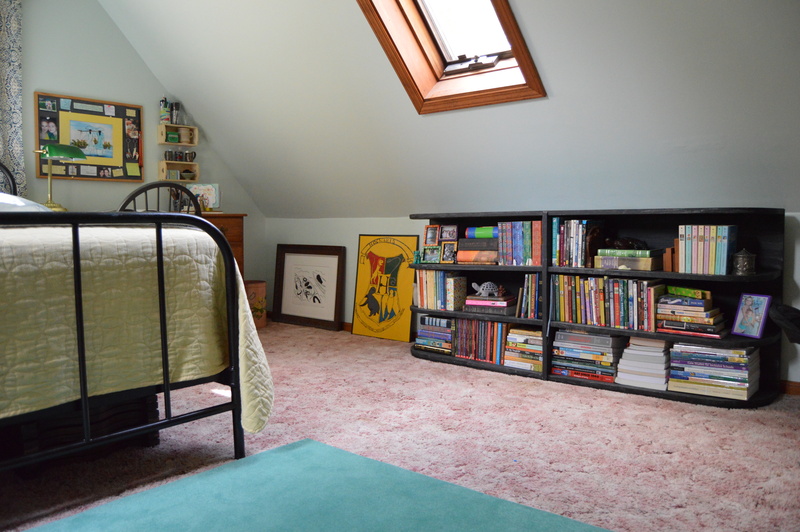 I am so, so happy with how the room turned out (even if it took me two years to finish!). The best part is that I spent very little on the transformation. I think all in all, including paint, the room cost under $200. 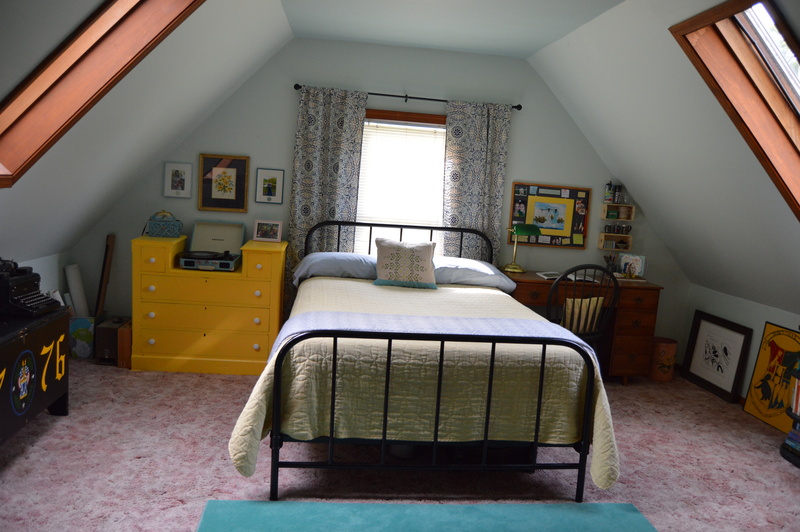 The biggest expenses were on paint for the walls and ceiling, spray paint for the bed, and paint and knobs for the yellow dresser. The only other things I purchased were a few yard sale frames, a curtain rod ($3 from Dollar General! ), and fabric for curtains (maybe $15 on clearance). Wood floors will be installed in the entire upstairs of the house, which will take care of the only part of the room I dislike- the ugly, 30-year-old, dust allergy inducing carpet. Woohoo! I really can’t wait (I’ll be sure to share pictures with the new floors…someday).